Another aspect of learning how to use your CNC router involves knowing how to properly secure material down to the bed of the machine. Rigidly securing material to the machine bed is crucial when setting up to cut. Some clamping methods are rigid but are more intrusive, while others keep a low profile but aren't quite as strong. Play around with these methods to see which ones you can use individually or in combination for your ideal setup. One of the fastest and easiest options for securing your material and can be found in most hardware and department stores. 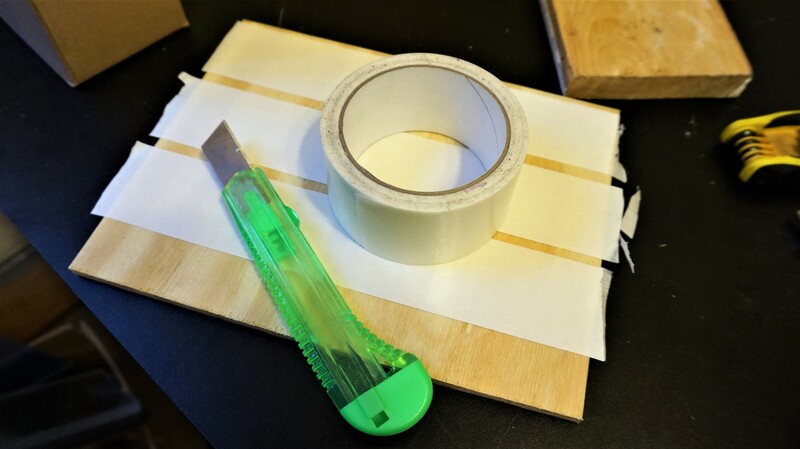 Carpet tape has surprisingly sticky adhesive on both sides, and works best when applied to flat pieces of material with a large surface area. Using carpet tape usually eliminates the need for workholding tabs since the final part is kept held down by the tape. Ensure surfaces are clean before applying carpet tape. Press firmly on your material to ensure both surfaces are adhered properly. Water will often cause the tape to loosen its hold on the tape; keep this in mind if you are using coolant. Clamps like the 2-inch c-clamp shown in the picture are simple and easy to use. Clamps of all shapes and sizes can be found in hardware stores and you can even find small, inexpensive ones in your local dollar store. Ensure that the router will not run into the clamps. 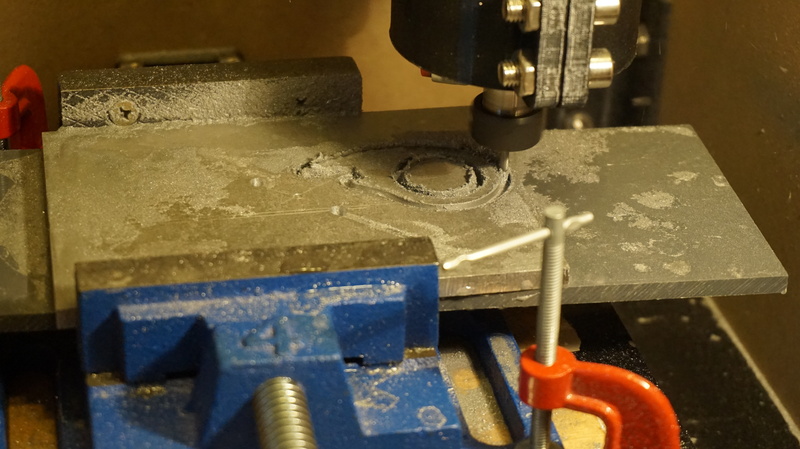 You can make sure by moving your router to the outer dimensions of the part you are making. 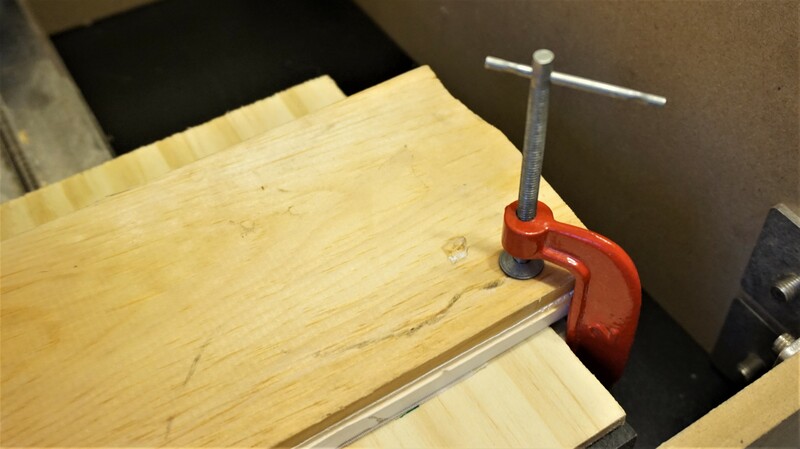 If you need to cut a part out of the material, you can use a combination of clamps and double sided carpet tape to secure your piece, otherwise, make sure to use workholding tabs in your part. Hot glue is a great workholding option for both flat and irregularly shaped materials. When used properly, it offers a higher degree of strength than carpet tape while eliminating the need for workholding tabs. Parts can be removed from the bed with a paint scraper or peeled off by hand. Using hot glue can sometimes be tricky since an even layer needs to be applied to keep the workpiece level. With some practice however, hot glue offers a quick, cheap, and effective workholding option. Hot glue will sometimes take chunks out of your material, especially with foam and wood. You can prevent damaging your work by applying glue strategically in areas that are not cosmetically important or used in thin layers which are easy to peel off. 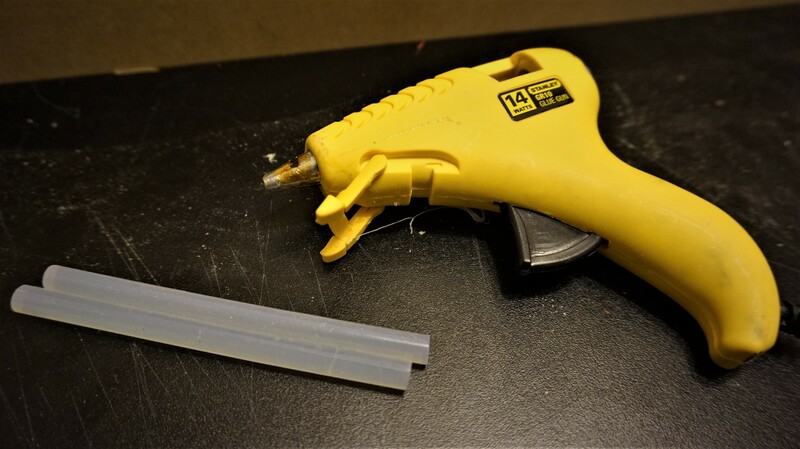 Hot glue hardens faster on metals (due to their high thermal conductivity) compared to other materials like plastic and wood. When using metals, apply glue to a non metallic wasteboard secured on the bed and place the material on top to secure it so that the glue has a chance to stick to both surfaces. 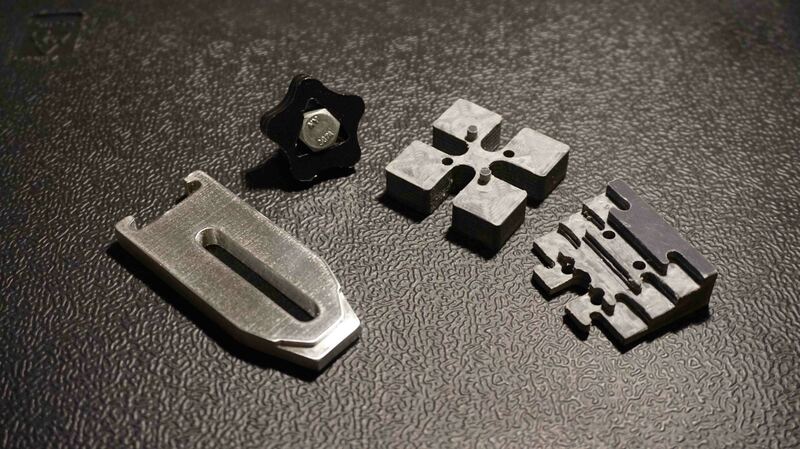 Vises come in all shapes and sizes, for hundreds of applications. Because of it's parallel facing jaws, a vice is perfect for holding square or rectangular items, but can be used to hold just about anything. Vises offer extremely high clamping forces, which are needed when milling tough materials. A low profile, 4-inch, cast iron drill press vise like the one shown below works well for firmly holding materials. Tall vises will decrease the height that the Z axis can travel. Make sure to pick a suitable vise which allows for enough clearance. Ensure the jaws of the vise are not in the way during the milling operation. We've made our own custom clamping system for the Mill One that can be made completely with an 1/8" end mill! These prototype machinist clamps will allow you to securely mount material to your Mill One with a very low profile using PVC, HDPE, and aluminum. Download the files to make your own, watch our video if you need some guidance, and let us know what you think! Here are some other workholding options suggested by the Sienci Mill One user community.